Weird things keep happening around the young nun Sister Claire. The blue-skinned angel Gabrielle just told her she's pregnant with a savior. Her mentor seems to be under a powerful curse. And she's going to have to unlock the secrets of Nun-Fu in order to make it to childbirth. 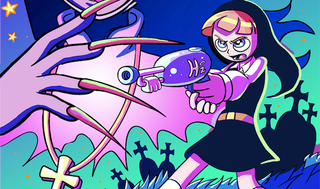 Elena "Yamino" Barbarich's Sister Claire is a goofball of a webcomic, one with magical girl nuns, bubbly cherubim that explode from toilets, holy water guns, and a Mother Superior who speaks like Yoda. It all starts innocently enough, with Sister Claire getting in trouble for playing with cats near the convent and, feeling like a burden, praying to God, asking if He has a plan for her. Her prayer is quickly answered in the form of an unusual annunciation: Gabrielle (not Gabriel) appears to Claire in the bathroom to inform the nun that she is pregnant. Amidst a swirl of pop culture references and out-and-out silliness, a plot emerges. These aren't Catholic nuns from our world; they're Catholic-ish nuns from a supernatural world, one in which nuns were recently at war with witches. But there's a fuzzy line between nunnery and witchcraft; both are driven by Energia, a power sort of like the Force. And while Sister Claire may feel like she doesn't fit into her convent, the truth is that many of her sisters are harboring secrets. And while witches may not necessarily be as wicked as the nuns say, the world still isn't safe for a young girl experiencing a divine pregnancy. All the bizarreness of the comic is nicely anchored by Sister Claire herself, who reacts to her world's weirdness with an unrelenting sweetness and curiosity. She's still very much a child and she's not particularly talented in the martial ways of her order, but her pluck and spine make her more than a mere MacGuffin in her own story. And while the path ahead of her is a dangerous one, it also may provide Claire with the things she has craved most in her life: friendship and a sense of purpose.